Alvin Dark in the dugout managing. I left some out or got some wrong, but remembering the 1962 Giants lineup (when I can't remember last night's film) is very self-impressive. This is when my love of baseball started. These were my guys. And baseball must be good for you because many of them are still alive. Alvin Dark's around 90. 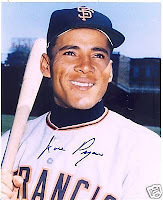 So I post this in memory, from memory, to the memory of my favorite shortstop, José Pagàn, who died yesterday.